One consideration in the emergent management of acute otitis media (AOM) is that diagnostic certainty for the disease is based on all 3 of the following criteria, as set forth by the American Academy of Pediatrics (AAP) and the American Academy of Family Physicians (AAFP): acute onset, middle ear effusion (MEE), and middle ear inflammation. Severe illness is defined as moderate to severe otalgia or temperature greater than 39°C, whereas nonsevere illness is defined as mild otalgia and temperature less than 39°C. AOM most commonly occurs in children and is the most frequent specific diagnosis in children who are febrile. Clinicians often overdiagnose AOM. Recurrent AOM is defined as 3 episodes within 6 months or 4 or more episodes within 1 year. Drawing of a normal right tympanic membrane. Note the outward curvature of the pars tens (*) of the eardrum. 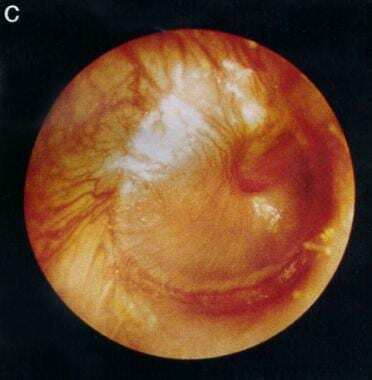 The tympanic annulus is indicated anteriorly (a), inferiorly (i), and posteriorly (P). 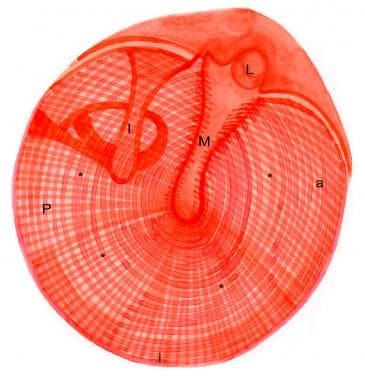 M = long process of the malleus; I = incus; L = lateral (short) process of the malleus. 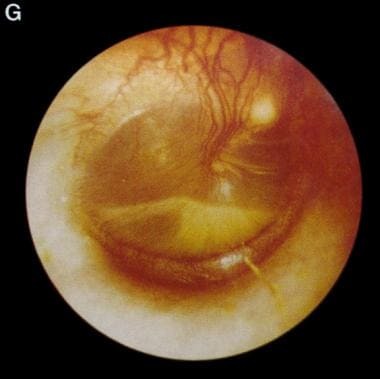 Tympanic membrane of a person with 12 hours of ear pain, slight tympanic membrane bulge, and slight meniscus of purulent effusion at bottom of tympanic membrane. Reproduced with permission from Isaacson G: The natural history of a treated episode of AOM. Pediatrics. 1996; 98(5): 968-7. Days after onset of symptoms, vessels continue across pars tensa, and a fluid layer of pus is noted. Reproduced with permission from Isaacson G: The natural history of a treated episode of AOM. Pediatrics. 1996; 98(5): 968-7. Insufflation, tympanometry, and acoustic reflexometry are helpful to identify the presence or absence of MEE. Of these, insufflation is the only one commonly used in the emergency department (ED) setting. Tympanometry and acoustic reflexometry cannot be recommended as a routine screening test for acute otitis media (AOM). However, in a patient in whom examination is difficult, normal tympanometric results may help to rule out AOM. Nasopharyngoscopy may reveal anatomic factors involved in AOM and show purulent matter at the nasal opening of the eustachian tube, but the findings are of no acute diagnostic value. No definitive laboratory examination exists for AOM, and hearing tests are not helpful in diagnosing the condition. Radiography and/or computed tomography (CT) scanning of the mastoid air cells may be helpful in select cases of suspected mastoiditis, but imaging studies are not valuable for diagnosis of AOM. As previously mentioned, diagnostic certainty in acute otitis media (AOM) is based on all 3 of the following criteria: acute onset, MEE, and middle ear inflammation. Severe illness is defined as moderate-to-severe otalgia or temperature greater than 39°C, whereas nonsevere illness is defined as mild otalgia and temperature less than 39°C. Children aged 2 years and older should receive antibiotics if the diagnosis is certain and if the illness is severe. If the diagnosis is uncertain, an observation period can be considered if the illness is nonsevere, and antibiotic therapy can be considered for severe illness. According to AAP/AAFP guidelines, an observation period may be recommended depending on the patient's age, the diagnostic certainty, and the severity of illness. An observation period is an option when the diagnosis is uncertain or when it is certain and nonsevere. The observation option is a 48-hour to 72-hour period of symptomatic treatment with analgesics and without antibiotics. If prescribed antibiotics, children younger than age 2 years and those aged 2-5 years with severe disease should receive 10 days of therapy. For those who are age 6 years or older with mild to moderate disease, 5-7 days is appropriate. Pain management is an important part of treating AOM. Appropriate analgesics should be offered. Studies have shown that antibiotics provide little benefit beyond placebo in mild cases of acute otitis media (AOM). The potential consequences of excessive antibiotic use are well known, and newer recommendations are that antibiotic prophylaxis for AOM should be avoided whenever possible. If antibiotic therapy is chosen, the AAP and FAAP recommend that amoxicillin 80-90 mg/kg/d is the antibiotic of choice. The length of treatment is 10 days for younger children and patients with severe illness, otherwise, a 5- to 7-day course is appropriate. If additional beta-lactamase-positive Haemophilus influenzae and/or Moraxella catarrhalis coverage is desired, the administration of high-dose amoxicillin and clavulanate potassium is recommended. If the patient is allergic to amoxicillin, alternatives are cefdinir, cefpodoxime, or cefuroxime if the allergic reaction is not a type 1 hypersensitivity. Patients with type 1 hypersensitivity should be given azithromycin or clarithromycin. Ceftriaxone injection (50 mg/kg/d) is recommended for children who are unable to take oral antibiotics and for patients with compliance problems. However, a single injection of ceftriaxone is insufficient against nonsusceptible pneumococci, with a bacteriologic failure rate of approximately 40%. In patients whose condition fails to improve after initial antibiotic therapy, a 3-day course of ceftriaxone offers outcomes better than those of a 1-day course. Topical quinolones are the preferred agents for the treatment of AOM in children with tympanostomy tubes (AOMT) and/or perforations. The treatment options for AOMT, as discussed in a clinical review by Schmelzle et al, include systemic or topical antibiotics. Topical treatment with fluoroquinolones is superior to that with systemic antibiotics and results in less antibiotic resistance and fewer adverse effects (ototoxicity) than do other treatments. The management of AOM should always include assessment of pain and fever. Antipyretics and analgesics may be necessary and should be prescribed liberally. Steroids, decongestants, and antihistamines are not effective in the treatment of AOM and may instead cause complications. Most cases of otitis media are self-limited. If the signs and symptoms of acute otitis media (AOM) are resolved, patients should follow up with their primary care provider (PCP) in 4-6 weeks to evaluate for persistent OME. In addition, patients discharged with or without antibiotic therapy should be reexamined 4-6 weeks after their initial presentation for evidence of middle ear aeration. Patients whose symptoms (eg, pain, fever) do not resolve within 48-72 hours of treatment should be reevaluated. Patients with persistent symptoms or recurrent AOM should be referred to an otorhinolaryngologist for evaluation and possible tympanocentesis. If antibiotics were started initially and if the patient's condition fails to improve, the antibiotic should be changed, and compliance must be emphasized. If an observation period is chosen, failure to improve within 48-72 hours should prompt initiation of antibiotic therapy. Mattos JL, Colman KL, Casselbrant ML, Chi DH. Intratemporal and intracranial complications of acute otitis media in a pediatric population. Int J Pediatr Otorhinolaryngol. 2014 Dec. 78 (12):2161-4. [Medline]. Thompson PL, Gilbert RE, Long PF, Saxena S, Sharland M, Wong IC. Effect of antibiotics for otitis media on mastoiditis in children: a retrospective cohort study using the United kingdom general practice research database. Pediatrics. 2009 Feb. 123(2):424-30. [Medline]. Lieberthal AS, Carroll AE, Chonmaitree T, Ganiats TG, Hoberman A, Jackson MA, et al. The diagnosis and management of acute otitis media. Pediatrics. 2013 Mar. 131(3):e964-99. [Medline]. Siddiq S, Grainger J. The diagnosis and management of acute otitis media: American Academy of Pediatrics Guidelines 2013. Arch Dis Child Educ Pract Ed. 2015 Aug. 100 (4):193-7. [Medline]. [Full Text]. Pichichero ME. Diagnostic accuracy, tympanocentesis training performance, and antibiotic selection by pediatric residents in management of otitis media. Pediatrics. 2002 Dec. 110(6):1064-70. [Medline]. [Full Text]. Rosenfeld RM. Diagnostic certainty for acute otitis media. Int J Pediatr Otorhinolaryngol. 2002 Jun 17. 64(2):89-95. [Medline]. Blomgren K, Pitkaranta A. Is it possible to diagnose acute otitis media accurately in primary health care?. Fam Pract. 2003 Oct. 20(5):524-7. [Medline]. Rosenkranz S, Abbott P, Reath J, Gunasekera H, Hu W. Promoting diagnostic accuracy in general practitioner management of otitis media in children: findings from a multimodal, interactive workshop on tympanometry and pneumatic otoscopy. Qual Prim Care. 2012. 20(4):275-85. [Medline]. [Guideline] Neff MJ. AAP, AAFP release guideline on diagnosis and management of acute otitis media. Am Fam Physician. 2004 Jun 1. 69(11):2713-5. [Medline]. Chao JH, Kunkov S, Reyes LB, Lichten S, Crain EF. Comparison of two approaches to observation therapy for acute otitis media in the emergency department. Pediatrics. 2008 May. 121(5):e1352-6. [Medline]. Spiro DM, Tay KY, Arnold DH, Dziura JD, Baker MD, Shapiro ED. Wait-and-see prescription for the treatment of acute otitis media: a randomized controlled trial. JAMA. 2006 Sep 13. 296(10):1235-41. [Medline]. Fischer T, Singer AJ, Lee C, Thode HC Jr. National trends in emergency department antibiotic prescribing for children with acute otitis media, 1996 2005. Acad Emerg Med. 2007 Dec. 14(12):1172-5. [Medline]. Venekamp RP, Sanders SL, Glasziou PP, Del Mar CB, Rovers MM. Antibiotics for acute otitis media in children. Cochrane Database Syst Rev. 2015 Jun 23. 6:CD000219. [Medline]. Coco A, et al. Management of acute otitis media after publication of the 2004 AAP and AAFP clinical practice guideline. Pediatrics. Feb 2010. 125(2):214-220. [Guideline] American Academy of Pediatrics. Diagnosis and management of acute otitis media. Pediatrics. 2004 May. 113(5):1451-65. [Medline]. Scott FD, et al. Principles of Judicious Use of Antimicrobial Agents. Pediatrics. Jan 1998. 100 (1):165-171. [Full Text]. Roark R, Berman S. Continuous twice daily or once daily amoxicillin prophylaxis compared with placebo for children with recurrent acute otitis media. Pediatr Infect Dis J. 1997 Apr. 16(4):376-81. [Medline]. Pelton S, et al. Recent Advances in Otitis Media. The Pediatric Infectious Disease Journal. Oct 2009. 28(10):S133-S137. Steele RW, Blumer JL, Kalish GH. Patient, physician, and nurse satisfaction with antibiotics. Clin Pediatr (Phila). 2002 Jun. 41(5):285-99. [Medline]. Schmelzle J, Birtwhistle RV, Tan AK. Acute otitis media in children with tympanostomy tubes. Can Fam Physician. 2008 Aug. 54(8):1123-7. [Medline]. [Full Text]. Hendrickson MA, Obeya E, Wey AR, Gaillard PR. Community Primary Care Provider Preferences for Emergency Department Follow-up Recommendations: A Regional Study. Pediatr Emerg Care. 2017 Mar 9. [Medline]. The authors and editors of Medscape Reference gratefully acknowledge the contributions of the previous authors, Kathy A Cook, MD, and Matthew J Walsh, MD, to the development and writing of this article.